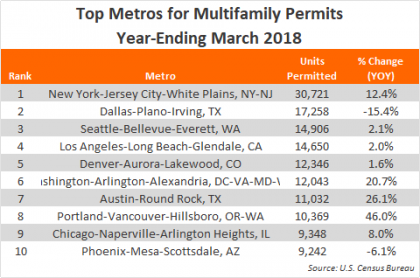 Annual multifamily permitting activity surpassed the 400,000-unit mark for the second consecutive month, and most leading metros saw permit volumes increase in March. 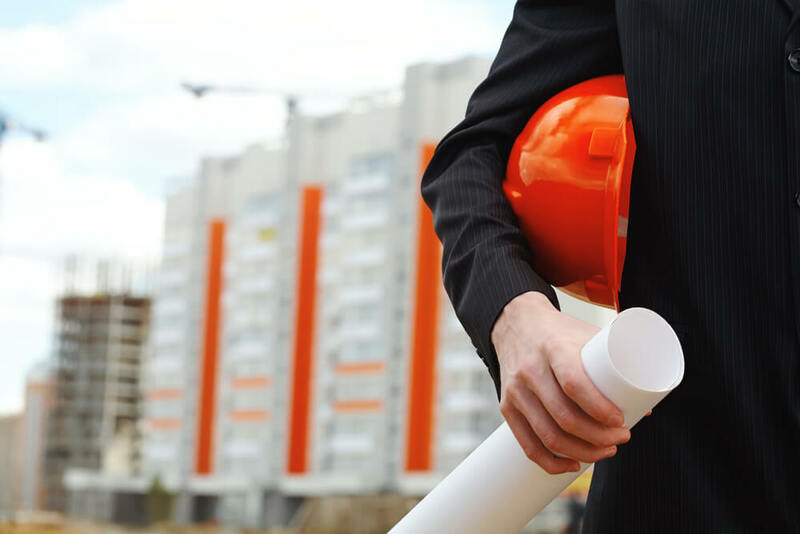 Local governments across the country approved 407,719 multifamily units in the year-ending March 2018, according to U.S. Census data. That permitting activity, inclusive of the 38,448 units authorized during the month of March, represents a 1.5% increase from February 2018’s annual volume and a 3.0% hike from March 2017’s annual total. This is the second consecutive month annual permit volumes topped the 400,000-unit mark. Permitting at that level has not occurred in back-to-back months since November 2016. Annual approvals ran slightly below 400,000 units in most months from December 2016 to January 2018. Those numbers represented a lull following a period of more significant permit volumes from June 2015 through November 2016, when annual totals averaged nearly 430,000 units. The metro-level top 10 list for annual permitting activity in March 2018 looks very much like the February leaderboard, with all 10 metros returning, mostly in the same order as last month. The only changes in March were Seattle and Los Angeles, which switched places. Seattle moved up one spot to the #3 position, while Los Angeles fell to #4. All but two of the top 10 markets experienced increases in annual multifamily permitting volumes from the previous year. While Dallas is a perennial top performer, this metro is showing signs of slowing. The 17,258 permits approved in the year-ending March 2018 were down 15.4% from the previous year’s total and 30% below the recent peak seen two years ago. Even so, overall permitting levels remain well above the market’s historical norm. Phoenix was the other metro leader to see a slowdown in the past year. However, while permits in the year-ending March 2018 were down 6.1% from the high point Phoenix reached in March 2017, the 9,242 units permitted in the past year remains well ahead of the long-term metro average. With the majority of the top 10 markets reporting at least some year-over-year increase in multifamily permits, the annual total of approvals in the top 10 metros – 141,915 units – was 6.6% greater than the 133,168 units issued in the previous 12 months. The total number of permits issued in the top 10 metros was almost equal to the total number of permits issued for the #11 through #37 ranked metros. For the month of March, the nation approved permits for 38,448 multifamily units, up 19.2% from the March 2017 volume. The metro-level leaderboard saw some major shifts since February, with half of the top-permitting metros replaced in March. New York remained at the top of the list, with 3,346 approvals. Denver climbed up from the #3 spot in February to land at second place in March. Seattle jumped up from the #10 ranking in February to sit at #3 in March. 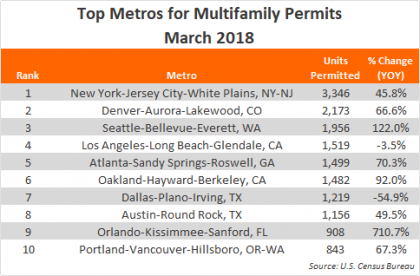 Los Angeles, Atlanta and Oakland were newcomers to the leaderboard in March, with monthly permit volumes around the 1,500-unit mark. Dallas was also new to the list this month, though it’s not uncommon to see the busy construction market in the rankings. While Austin inched down to #8 from its previous standing at #7, this month’s permit volume of 1,156 units is well ahead of the 772 units approved in February. Orlando fell from #4 to #9 in March, but the 908 permits issued this month is more than seven times the volume approved in March 2017. This was the leaderboard’s greatest year-over-year change. Portland was also new to the list in March, with 843 units approved, 67.3% more than this metro saw permitted in March 2017. The introduction of Los Angeles, Atlanta, Oakland, Dallas and Portland to the leaderboard pushed out Washington, Charlotte, Raleigh, Phoenix and San Francisco from the standings.